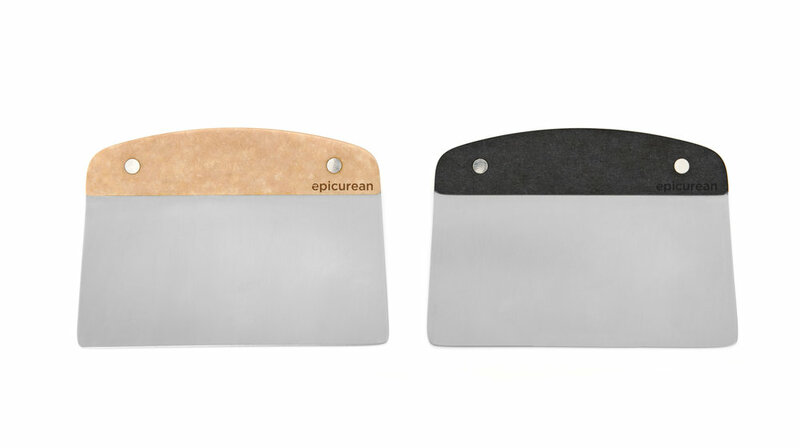 Epicurean utensils are made using the same Richlite, wood fiber material used to create the cutting boards. These tools will give you the look and feel of using a wooden tool with the longevity needed by demanding commercial kitchens. These solid tools are built for the heaviest kitchen work you can throw at them. They feature long, sturdy handles, deep bowls, beveled edges and are built to last. Extend your reach with these Epicurean stirring paddles. Made from the same material as our other tools and cutting surfaces, they will stand up to the day-in, day-out challenges of your professional kitchen. These will last longer than typical wood or plastic paddles and will not harbor bacteria. Our Magnetic Knife Holders securely display all types of knives. The sleek design conceals powerful, rare-earth neodymium magnets to hold knives in place. Crafted from our knife-friendly signature wood composite, the surface will not scratch or dull blades like traditional metal knife strips. Easily attaches to the wall with the included screws and wall anchors. Brewers, paddle your mash. Epicurean’s mash paddles are designed with all-grain brewing in mind. Two sizes are available to suit big- and small-scale operations, and will reach the bottom of almost all mash tuns. The hop-shaped holes in the paddle base will allow grain to pass through with no problem, and once you’re done you can hang it up thanks to the hang hole in the handle. And these two-toned paddles look really good hanging on your wall. Although these look and feel like wood, they’re better than wood; our material is non-porous which means they do not harbor any bacteria, and they won’t crack or split after prolonged time in water. The USA–made, industry standard type 304 stainless steel and Richlite, our signature wood fiber, are a perfect combination. The riveted handle and stainless blade ensure this tool will last a lifetime. If making pizza is one of your passions, this tool is for you. The long handled peel has been specifically designed for pizza ovens. The narrow head with beveled edges on three sides gives you maximum pie maneuverability and the 39" long handle will let you access every corner of the oven. The handle is strengthened by slate colored scales top and bottom, hand riveted to the peel with custom, USA-made brass rivets.